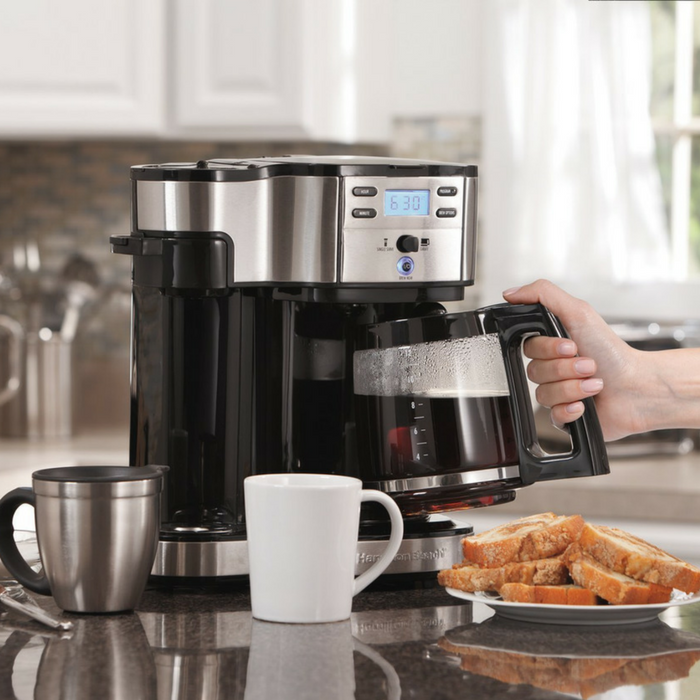 Hamilton Beach Coffee Brewer And Maker Just $45! Down From $89! PLUS FREE Shipping! You are here: Home / Great Deals / Amazon Deals / Hamilton Beach Coffee Brewer And Maker Just $45! Down From $89! PLUS FREE Shipping! For a limited time only! Hurry over to Amazon to get this Hamilton Beach Coffee Brewer And Maker for just $45 down from $89.50 PLUS FREE shipping! For all the coffee drinkers and aficionados who despise the long café lines, dread the overwhelming coffee options or need a fix for those early morning caffeine pains – fear no more! There’s finally an affordable, low-maintenance coffeemaker that can brew a basic or premium roast coffee in a fraction of the time and cost as the coffeehouse: The Hamilton Beach 2-Way Brewer. Uses ground coffee, unique scoop measures and filters ground coffee for the perfect cup every time. Brew strength function for bold or regular coffee and fully programmable with auto shutoff.